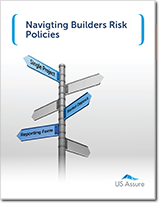 Insuring clients’ residential and commercial course of construction projects means selecting the best builders risk insurance policy that meet their needs. However, with several policy options to choose from, how do you know which one is right for your client? Making the best choice is simple when you have the right information at your fingertips. And, this simple resource can help busy agents make a quick, informed selection for every opportunity. Complete the form to download our guide today.